Recruitment is one of the most important things for any organization to ensure most effective hiring. HR managers use different types of recruitment methods to have more and more potential applicants. They come up with innovative recruitment methods to find the most perfect candidate for any job opening. These days digital recruitment trends are the latest addition to the effective recruitment strategies and practices. 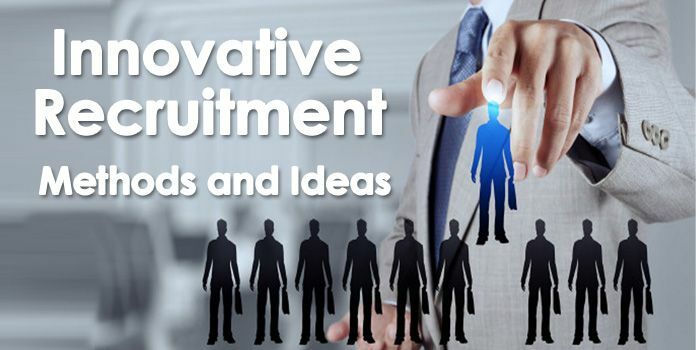 In this post, we will be discussing innovative and creative recruitment ideas that are used by HR managers. Find out the emerging trends in recruitment and selection process and alternative recruitment methods used in present times. Companies conduct structured employment interviews in which there is a set of questions which are asked to every applicant and based on that selection is done. This is a promising method of recruitment which doesn’t get affected by biases. Here, the interviewer has to research and develop effective and smart questions to be posed during the interview which can help them select the right candidate for the profile. This is another way of recruiting and is surely a very convenient and effective way to interview when your candidate is sitting at some other location altogether. With video recording, you not only save on your time and money but you can also have an access to a bigger pool of candidates to interview. To get much finer results, collecting data on body language like movement of eyes, any kind of non-verbal communication will be very helpful. It is extremely important that the person you are selecting has some level of IQ in him for a particular profile. Also known as GMA or General Mental Ability test, it is very helpful in measuring a person based on his academic knowledge. No matter which position it is or which sector it is, IQ tests reveal the speed to learn new things and also how successful will be a person in a particular job. Though IQ is not everything but it does help in rejecting the candidates who are not that competent. This is a smart recruitment method when you are hiring online. In this kind of recruitment method, there is an automatic posting of job ads that focus on the candidate profiles you are in search of. This involves recruiting on niche sites which is definitely a creative way to recruit. It is all about making your good prospects see your job posting advertisement and apply for the job. With a Job Knowledge Test, you can have a deeper insight of a person’s expertise in a particular role. The results of this test help a manager know that what all things the candidate already knows. In short, the results indicate everything that a person knows in relation with the profile he has applied for, thereby, making the process of selection easier and more accurate. But this test has some limitations as it just highlights the procedural knowledge of a person but doesn’t predict the decision-making abilities. There are various passive candidates out there who are not looking for any kind of job change as of now. By establishing a connection with them using social media platforms, you can lay road to future connections when they are looking for a job change. This kind of approach may not benefit you in real time but in long term, companies can make their recruitment methods a lot more diversified with passive candidates included in their list. Just like knowing the knowledge aspect of a candidate, it is also important to know his behavioural aspect. Integrity Test aims at finding these behavioural traits because though knowledge is important but how a person behaves in a situation is even more important. With this test, you can know about the level of honesty, dependability, commitment and dedication a person has towards his work which again is extremely helpful in recruitment process. In the digital recruitment trends, social media is an amazingly impressive alternative recruitment method. You can use Facebook, Twitter, LinkedIn and Instagram to develop connections with all those who are looking out for a job. This will help you have applications from different locations which will give you a much bigger candidate pool to make the best of the selections for whichever post you want. Employers must not miss on Employer Review Sites because they play a very strong role in recruitments. Sites like Glassdoor should always be given importance. Job seekers are always looking for information about the companies for which they are applying and if they find bad reviews about a company then it is a serious loss for the employer. Don’t miss this effective recruitment strategy and practice which can help you save yourself from losing a good candidate. This is another recruitment method used by HR managers. Though you have kept your options for hiring open but you must not forget that you can use your employee referrals as well. This is a smart way of reducing your cost and saving your time. Not only that, this method ensures highest ROI. So before you step out and look for candidates by spending a lots of your money, ask your employees for referrals and there are bright chances that you might just get lucky. These are some of the innovative recruitment ideas used by HR managers to hire the most potential candidates. A human Resources Recruiter is responsible for recruitment success in an organization. A recruiter plays a critical role in hiring the best possible talent in the organization. The key tasks of a HR Recruiter includes developing and executing recruiting plans, maintaining network through industry contacts, association memberships, trade groups and employees, coordinate and implement recruiting initiatives and is responsible for administrative duties and recordkeeping. Below are the most frequently asked HR Recruitment interview questions and answers. However, you should be prepared with other questions as well. 1 Q: Say something about yourself. A: This question is a very basic question that comes up almost all the time in interviews. Describe about your educational and employment experience in a few sentences. Do not include any irrelevant personal information when answering this question. Answer this question truthfully and in brief. Also, try to relate yourself with the job you are interviewing for so as to be considered as a good fit for the organization. 2 Q: Why are you interested in working in this company? A: In preparation for this answer, knowing about the company and doing some research beforehand is necessary. It is a great opportunity to focus on a fact about the company that is of particular interest. Include your skills and experience along with this fact in your answer. As a candidate for HR recruiter, you should have interest in the dynamics of the company. However, whatever you say it should also reflect contribution towards the company apart from your own interest. 3 Q:. Describe recruitment and selection process. A: Recruitment is the process of identifying that the organization needs to employ someone up to the point at which application forms for the post have arrived at the organization. Selection then consists of the processes involved in choosing from applicants a suitable candidate to fill a post. The first step in a recruitment and selection process includes sourcing candidates which can be done through advertising, career sites etc. The next step involves reviewing the resumes after which a phone interview is conducted. A face to face interview is then scheduled and a suitable candidate is selected. 4 Q: What do you mean by Job Analysis? A: Job Analysis is a process to identify and determine in detail the particular job duties and requirements and the relative importance of these duties for a given job. Job Analysis is a process where judgements are made about data collected on a job. The purpose of Job Analysis is to establish and document the job relatedness of employment procedures such as training, selection, compensation and performance appraisal. 5 Q: How will you rate your interpersonal skills? A: Interpersonal skills relate to your ability to work with others. They help you focus on recognizing other’s individuality, communicating effectively, and working as a team member, mediating differences and listening to others. You need to give an honest answer to this question. Do not underrate or overrate yourself. 6 Q: What is the difference between staffing and recruiting? A: Staffing and recruiting are two extremely important functions of any human resources department. Staffing starts from the entry of the individual to an organization and continues through all stages until his or her exit from the company. However, recruitment is done at the initial stage of staffing. Recruitment refers to the process of attracting, screening, and selecting qualified people for a job at an organization. 7 Q:. Why should we hire you? A: The interviewer wants to find out what sets you apart from other candidates. It is better to give an answer on the basis of the flow of the interview. Listen to what the interviewer is saying about what are they looking for and answer accordingly. Be relevant and honest in your answer. Describe the skills you possess which are required for the job and show how you will be the best fit for the organization. 8 Q:. What are your strengths and weakness? A: The interviewer through this question wants to know what skills, talents and employee you possess. Through this question, he will be able to say whether you will make a great candidate as an addition to the team. The strengths you mention should relate to the position you are interviewing for. You need to give examples of your strengths. While answering about your weakness avoid being negative instead be positive and give an honest answer. The weaknesses you mention should not be directly related to the job. Also mention what steps you are taking to overcome your weakness. 9 Q:. What employee recruitment, selection and development strategies have you used in your previous job? A: The interviewer wants to test you whether you are fully aware of the different employee recruitment, selection and development strategies. Always remember that HR activities need to be aligned with organizational priorities and employee needs. This includes understanding the overall business strategy, conducting a SWOT analysis, determining key employee issues and developing an action plan. 10 Q: Do you keep HR policies and procedures current in terms of new legislation and regulations? A: It is important for an HR recruiter to have the ability to understand new legislation and regulations and to introduce changes accordingly. For keeping yourself updated with the new legislations and regulations an HR recruiter needs to attend seminars, subscribe to journals and newsletters etc. You need to give an honest answer to this question. 11 Q:. What do you think are the main challenges facing Human Resources Management today? A: You need to be aware of the current HR trends so as to answer this question. There are various challenges in Human Resources Management. An HR recruiter should be aware of the challenges facing Human Resources Management. Highlight the important issues and give your opinion of what you think about it. Keep your answer brief and to the point. Here is Staff Recruitment and Selection Policy of A Company. The recruitment and selection decision is of prime importance as the vehicle for obtaining the best possible person-to-job fit which will, when aggregated, contribute significantly towards <Company>’s effectiveness. It is also becoming increasingly important, as the Company evolves and changes, that new recruits show a willingness to learn, adaptability and ability to work as part of a team. The Recruitment & Selection procedure should help managers to ensure that these criteria are addressed. conform to all statutory regulations and agreed best practice. To ensure that these policy aims are achieved, all appointing managers will receive training in effective recruitment and selection. Define the job. If it is an existing post – is an exact replacement required or is this an opportunity to revise the requirements. If it is a newly established post be clear on the exact requirements, draw up a job description and consult the appropriate Director / Human Resources Department in relation to the appropriate grade and / or salary. in the event of the job being newly established, the approval of the Chief Executive, and confirmation from the Director of Finance, that funding is available. Send the Job Vacancy Form to the Human Resources Department / Company Administration Office for processing. No vacancy can be processed without this authorisation. It is important that this pack is carefully put together in order to present a professional image of the Company, therefore out-of date or poorly presented information is not suitable. Design the advertisement. All advertisements must contain as much information as possible to ensure the correct recruitment group is targeted and reduce unsuitable applications, while remaining as cost-effective as possible. External adverts should be submitted to the appropriate Director / senior manager with costings for approval before being placed. Appropriate selection procedures must be used for each post. Procedures may vary, at its simplest this may involve a straight forward interview and skills testing. For more senior posts psychometric testing, presentations to the interview panel on a chosen topic and/or a series of individual interviews on various topics may be included. The appointing manager will approach relevant people to assist with shortlisting and interviewing. At least two people should be involved in shortlisting and sit on the Interview Panel. The application forms received by the closing date will be forwarded to the appointing managers for shortlisting. Applicants must be chosen against the Person Specification. It is the responsibility of the appointing manager at this stage to record (in writing) the reasons why an applicant is not shortlisted. All papers must be returned to the Human Resources Department / Company Administration Office, who will invite the candidates for interview, obtain references and make the necessary housekeeping arrangements for the interview. This will include timetabling the interviews and arranging any pre-employment checks if appropriate. Candidates who have not been shortlisted will also be informed. receive the references and pre-employment checks for candidates from the Human Resources Department / Company Administration Offices, and be responsible for ensuring the confidentiality of these, and for their safe return to the Human Resources Department / Company Administration Offices for destruction. At the interview, the appointing manager will ensure that the Interview Report Form is completed as fully as possible. When interviewing, they will ensure that Equal Opportunities legislation is strictly adhered to, with no discrimination shown on any grounds. When all candidates have been interviewed, the panel will score them appropriately, and based on this decide on the most suitable person for the post. The appointing manager will arrange to inform the successful candidate as soon as possible, agreeing a commencement date and starting salary. All interview packs should be returned marked “private & confidential” to the Human Resources Department / Company Administration Offices for filing for future reference if necessary. notify the Manager if the appointee refuses the offer, or if there are any other details to be cleared. deal with any requirements for removal expenses or the finding of temporary accommodation for the appointee. The Human Resources Department / Company Administration Offices will arrange, in conjunction with the appointing manager an individual programme of induction for the new start which will be arranged and agreed at least one week before the appointee commences. Find attached a recruitment & joining checklist. Kindly go through it and let me know if anything else can be added to it during the recruitment & joining of a candidate. 5- PHOTOS (PASSPORT SIZE) 4 NOS. I have attached Excel sheet which is ready to fill the whole recruitment processes from screening of the applicants CV’s to joining the company. I have attached a recruitment tracker where you can mention about the complete recruitment status from DATE OF JOINING to DATE OF GOAL SETTING. A) Activities Handled at a glance. Releasing an advertisement for recruitments. To get the details of a training program. To assess the need for providing the training of that particular program. Sending suitable candidate / s concerned in that particular stream or area for the program. One month prior notice is to be given. Obtaining the approval from competent authority – COO (via note) and getting the acceptance. Handling over the all relevant document to the person concerned duly acknowledged. Clearance or recovery of dues if any related to company. Issue of experience certificate and relieving letter. Balance of leave is to be checked before applying. Applying for the leave in the prescribed format and getting it signed by the recommending official. Forwarding the same to the to COO for sanction. Submitting the same to HRD.